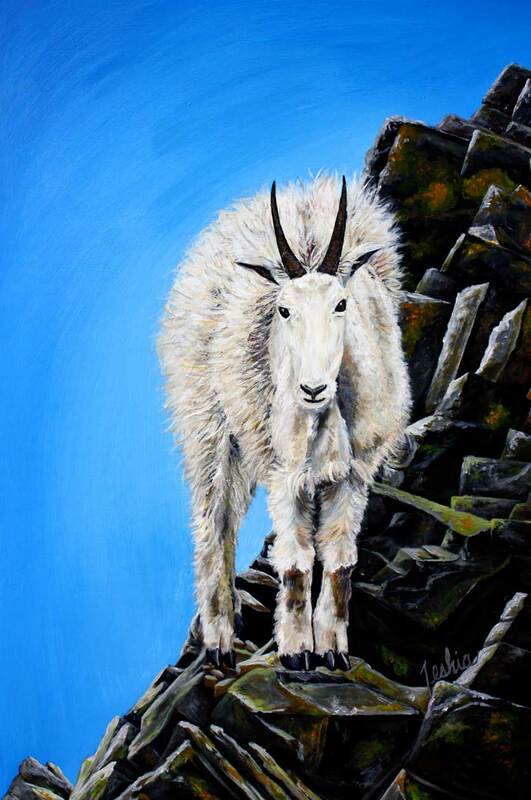 Teshia painted Cliffhanger in honor of her deep love for Glacier National Park in her home state of Montana, and to celebrate all of the magnificent Mountain Goats that inhabit the park. Living in North-western Montana, she has spent many summers in the park, and looks forward to new camping & hiking adventures, as well as road trips over the world-famous Going to the Sun Road, in this breathtakingly beautiful & wild area every summer. It is her favorite place on Earth, and is also the inspiration behind many of her signature Contemporary Western Wildlife paintings of moose, elk, deer, grizzlies, foxes, fish, lynx, and other Rocky Mountain Wildlife that are native to the area. Cliffhanger represents the many Mountain Goats that can be seen climbing the cliffs at the top of Logan Pass in the summertime. Many of these goats have become so tame to hikers, that they are commonly seen up close & personal—and just as curious about us as we are about them, just as Cliffhanger appears to be. The Original Cliffhanger Painting is a very unique, bright & bold piece. He was created by Teshia on a beautiful heavy-duty 2" deep wooden panel "canvas" with her signature vibrantly-colored acrylic paints. He is embellished with striking metallic accents of gold, pearl, silver, copper & bronze, while his snow-white fur is highlighted with sheer blue/violet iridescent details. The metallic & pearl accents, which accentuate the goat as well as the rocks around him, shine vibrantly under direct lighting, while detailed areas of his fur catch subtle glimpses of beautiful iridescent blue/violet highlights when viewed at certain angles. He is truly eye-catching. Unfortunately, neither the metallic nor the iridescent accents are able to be seen in images or prints of this piece, as these sheer details are something that can only be viewed on the original piece, and are part of what makes the original Cliffhanger so special.